Ri Sol Ju (3rd R) and Kim Yo Jong (L) watch Giselle, as performed by the National Ballet of China at the Mansudae Art Theater in Pyongyang on April 14, 2018 (Photo: Rodong Sinmun). Ri Sol Ju shakes hands with CPC International Liaison Department Director Song Tao in the lobby of the Mansudae Art Theater in central Pyongyang on April 14, 2018 (Photo: KCNA/Rodong Sinmun). Ri Sol Ju (Ri So’l-chu), first lady of the DPRK, watches the National Ballet of China perform Giselle at Mansudae Art Theater in central Pyongyang, as part of the 31st annual April Spring Friendship Art Festival. 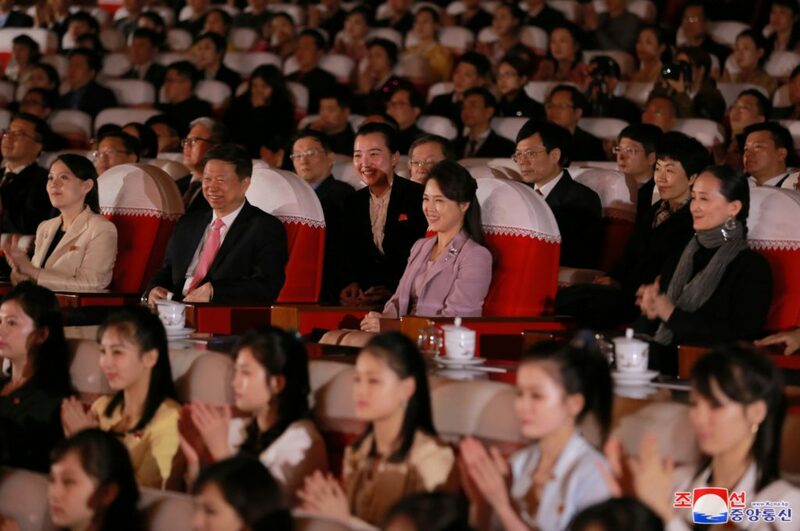 She watched the performance with Communist of Party of China [CPC] International Liaison Department Director Song Tao, PRC Vice Minister of Culture and Tourism Li Qun, PRC Ambassador to the DPRK Li Jinjun, among others. Also in attendance were Kim Yo Jong, WPK Vice Chairman and State Affairs Commission Vice Chairman Choe Ryong (Ch’oe Ryong-hae), WPK Vice Chairmen Ri Su Yong (Ri Su-yo’ng) and Kim Yong Chol (Kim Yo’ng-ch’o’l), WPK Central Committee Deputy Directors Ryu Myong Son (Ryu Myo’ng-so’n) and Kim Song Nam (Kim So’ng-nam), Rodong Sinmun editor Kim Pyong Ho (Kim Pyo’ng-ho), Personal Secretariat deputy chief and WPK Organization Guidance Department Deputy Director Jo Yong Won (Cho Yo’ng-wo’n), Minister of Culture Pak Chun Nam (Pak Ch’un-nam), Personal Secretariat Director Kim Chang Son (Kim Ch’ang-son) and other WPK and DPRK Government officials. 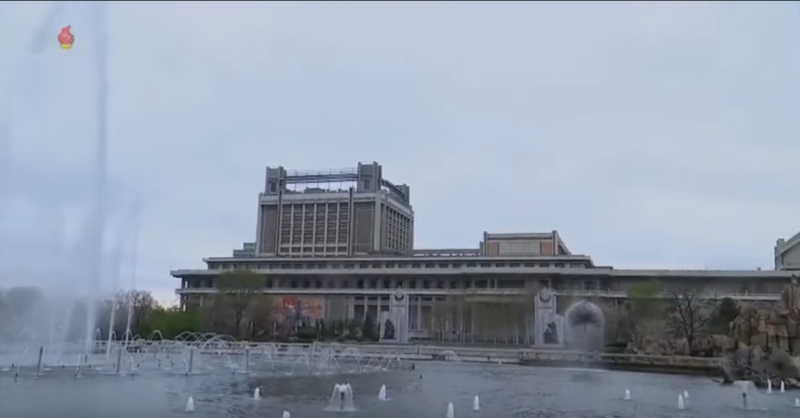 View of the fountains and the Mansudae Art Theater on April 14, 2018 (Photo: KCTV). 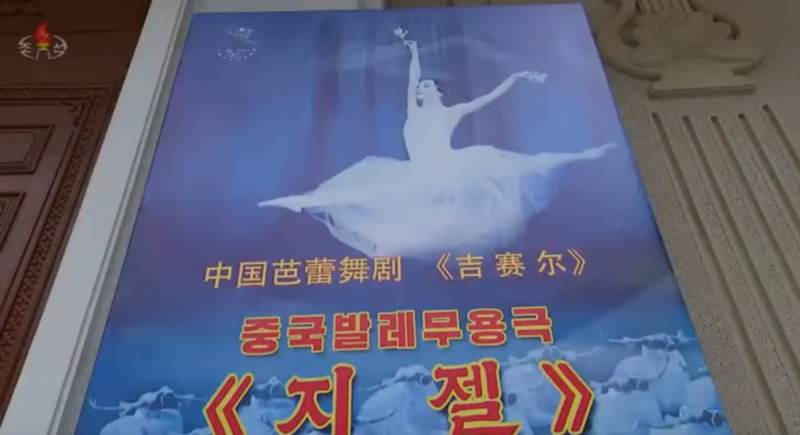 Poster for the National Ballet of China’s performance of Giselle, which has a short run at the Mansudae Art Theater as part of the 31st annual April Spring Friendship Art Festival (Photo: KCTV). Ri Sol Ju speaks with Song Tao and artistic directors of the National Ballet of China in a reception room at Mansudae Art Theater in Pyongyang on April 14, 2018 (Photo: Rodong Sinmun/KCNA). 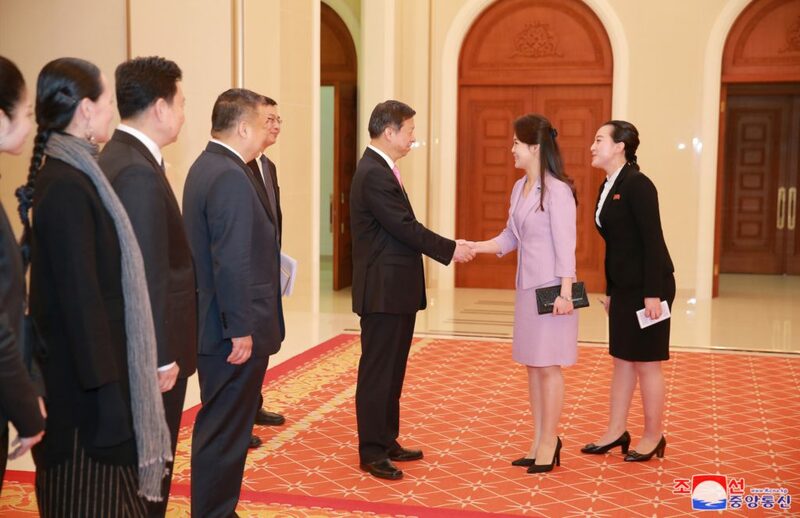 Ri Sol Ju was “warmly greeted” by Song Tao and other Chinese guests. She “warmly welcomed the Chinese art troupe’s visit to the DPRK and had a friendly talk with the guests in an amicable atmosphere.” The performance was done “with high artistry, touching the heartstrings of the audience.” At the end “spectators mounted the stage to present bouquets to the performers, raising loud applause.” Ri Sol Ju had a large floral basket delivered to the ballet troupe. 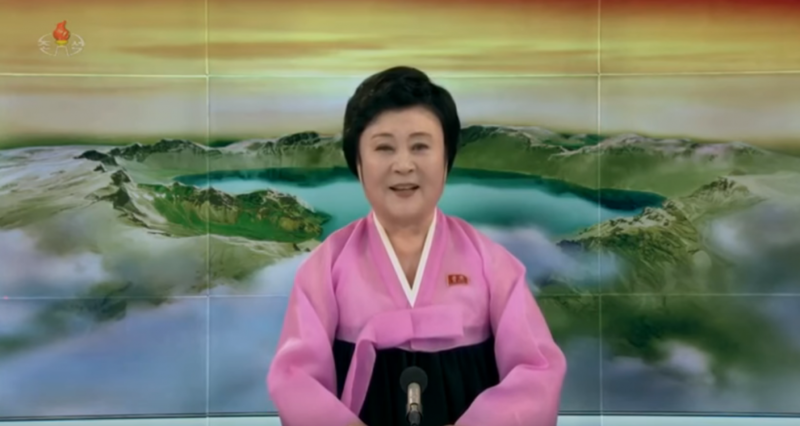 KCTV senior anchorwoman Ri Chun Hui reads out a report about Ri Sol Ju’s attendance of the ballet performance on KCTV News on April 15, 2018 (Photo: KCTV).